The Monitor UV Germicidal storage cabinet measures 24-1/2"W x 32"H x 9-1/2"D. The cabinet holds 6 glasses or 5 goggles to a shelf on 8 shelves. With an average kill rate of 99.2%, the monitor provides excellent protection in 5 minutes. Shuts off automatically if the double doors are opened. Pilot light confirms that the UV lamp is in use. Five minute cycle is controlled by a timer and doors are interlocked with tamper resistant latches. Germicidal lamp has a 20 year limited warranty. Lockable, two keys provided. Wall or shelf mountable with a 7' grounded electrical cord. Underwriters Laboratories Inc. Listed: File # E140818. 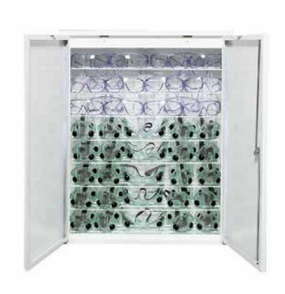 No direct UV radiation escapes from cabinet when in use.